Did you know you can get your teeth cleaned right here on campus? 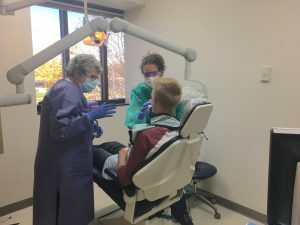 This dental care is available, thanks to RCTC’s dental hygiene clinic, which is staffed by the students and faculty of the Dental Hygiene program. Since 1992, the clinic has offered a range of preventative dental care, including dental cleanings, X-rays, sealants, and more. Access to this care is open to everyone: students, family members, community members, and even children. The clinic, located at the Heintz Center campus, is open from 12:30-9 p.m. on Tuesdays and Thursdays through February. For appointments or more information, call 507-280-3169. Clinical experience is a significant part of the Dental Hygiene curriculum, giving students a chance to get hands on experience in the field under the guidance of program faculty and a supervising dentist. Current students in the program related their appreciation for this opportunity to test their skills in a variety of different situations. Program director Anne High supervises Jess Ludden as she inspects a patient’s teeth. Participation in the clinic gives Dental Hygiene students valuable hands-on experience in the field. Because of the variety of basic dental services offered, students see patients needing treatments in varying levels of difficulty and are able to apply information from the classroom in real-world scenarios. “In the long run, it helps us to be more experienced and prepared for the real world,” said Eunice Russell, another Dental Hygiene student completing her second year in the program. In addition to serving those who may not have access to regular dental care, the clinic functions as an educator for patients. Russell, who is from the Bahamas, is able to add personal perspective on the impact of this difference in dental standards. Because of her own experiences going to the dentist as a child, she now has a passion to help others understand the importance of dental hygiene. “I just want to help people not go through what I did,” she said. Classmates Liz Krohe and Eunice Russell practice techniques on each other during a break at the clinic. She feels fortunate to have been accepted into RCTC’s highly competitive program, which enrolls only 16 students yearly. Her hope is to return to the Bahamas after graduating with her associate’s degree in the spring to help educate about the benefits of better technology and higher standards of care. Krohe’s journey to dental hygiene was fueled by a similar desire to help people improve their health. Originally a nursing student, she’s worked in fields caring for people for 10 years. 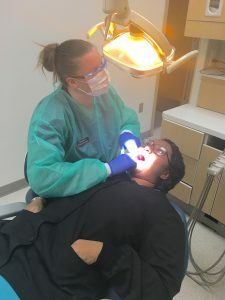 She came to RCTC intending to apply to one of the Mayo health programs, but when someone showed her the dental hygiene program, her plans quickly changed. Krohe will graduate with her associate’s degree in the spring and plans to study online for a bachelor’s degree in Dental Hygiene from Metropolitan State through the new dual enrollment arrangement with RCTC. After that, she’ll complete an online master’s in Dental Therapy. In the meantime, she intends to put her skills to work at a dental office and start helping people right away. Both agreed that the integration of clinical experience as part of the program’s curriculum solidified their dedication to this career path.